LBJ's "X" File on Nixon's "Treason"
On May 14, 1973, Walt W. Rostow, who had been National Security Adviser during some of the darkest days of the Vietnam War, typed a three-page "memorandum for the record" summarizing a secret file that his former boss, President Lyndon Johnson, had amassed on what may have been Richard Nixon's dirtiest trick, the sabotaging of Vietnam peace talks to win the 1968 election. Rostow reflected, too, on what effect LBJ's public silence may have had on the then-unfolding Watergate scandal. As Rostow composed his memo in spring 1973, President Nixon's Watergate cover-up was unraveling. Just two weeks earlier, Nixon had fired White House counsel John Dean and accepted the resignations of two top aides, H.R. Haldeman and John Ehrlichman. Three days after Rostow wrote the memo, the Senate Watergate hearings opened as the U.S. government lurched toward a constitutional crisis. Yet, as he typed, Rostow had a unique perspective on the worsening scandal. He understood the subterranean background to Nixon's political espionage operations. Those secret activities surfaced with the arrest of the Watergate burglars in June 1972, but they had begun much earlier. In his memo for the record, Rostow expressed regret that he and other top Johnson aides had chosen -- for what they had deemed "the good of the country" -- to keep quiet about Nixon's Vietnam peace-talk sabotage, which Johnson had privately labeled "treason." "I am inclined to believe the Republican operation in 1968 relates in two ways to the Watergate affair of 1972," Rostow wrote. He noted, first, that Nixon's operatives may have judged that their "enterprise with the South Vietnamese" -- in frustrating Johnson's last-ditch peace initiative -- had secured Nixon his narrow margin of victory over Democratic Vice President Hubert Humphrey in 1968. Rostow also was aware that -- as the Watergate scandal deepened in late 1972 and early 1973 -- Nixon's men had curiously approached the retired President Johnson with veiled threats about going public with their knowledge that Johnson had ordered wiretaps to spy on their Vietnam peace sabotage in 1968. Apparently, Nixon thought he could bully Johnson into helping shut down the Watergate probe. Instead, the threat had infuriated Johnson, who was still pained by his failure to end the Vietnam War before he left office on Jan. 20, 1969, a tragic lost opportunity that he blamed on Nixon's treachery and deceit. Just a couple of weeks after receiving Nixon's overture about the 1968 bugging and two days after Nixon was sworn in for a second term, Johnson died of a heart attack on Jan. 22, 1973. So, in spring 1973, Rostow found himself in a curious position. 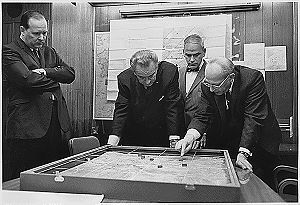 As Johnson's presidency ended in 1969 -- and at Johnson's instruction -- Rostow had taken with him the White House file chronicling Nixon's Vietnam gambit, consisting of scores of "secret" and "top secret" documents. Rostow had labeled the file "The "X' Envelope." 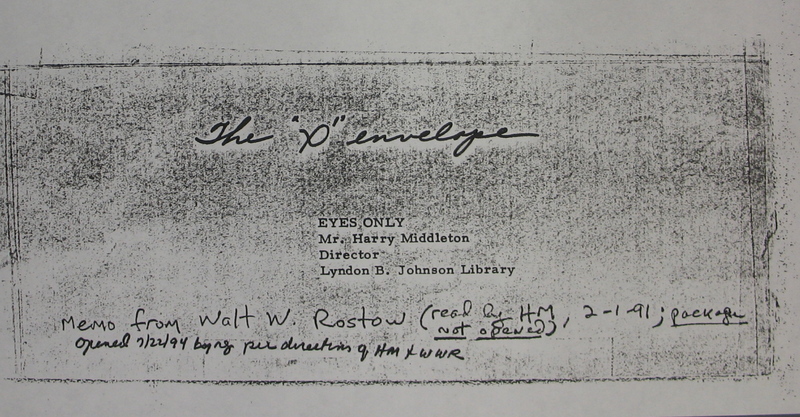 Walt Rostow's "The 'X' Envelope"
Also, by May 1973, Rostow had been out of government for more than four years and had no legal standing to possess this classified material. Johnson, who had ordered the file removed from the White House, had died. And, now, a major political crisis was unfolding about which Rostow felt he possessed an important missing link for understanding the history and the context. So what to do? Rostow apparently struggled with this question for the next month as the Watergate scandal continued to expand. On June 25, 1973, John Dean delivered his blockbuster Senate testimony, claiming that Nixon got involved in the cover-up within days of the June 1972 burglary at the Democratic National Committee. Dean also asserted that Watergate was just part of a years-long program of political espionage directed by Nixon's White House. The very next day, as headlines of Dean's testimony filled the nation's newspapers, Rostow reached his conclusion about what to do with "The 'X' Envelope." In longhand, he wrote a "Top Secret" note which read, "To be opened by the Director, Lyndon Baines Johnson Library, not earlier than fifty (50) years from this date June 26, 1973." "Sealed in the attached envelope is a file President Johnson asked me to hold personally because of its sensitive nature. In case of his death, the material was to be consigned to the LBJ Library under conditions I judged to be appropriate.